This is the one page of this website that I am making personal, and that is because it is the best way for me to write about what life is like in Bandon. Quite recently, my husband and I made the choice to move here. It was for some well-thought out reasons; we were looking for the kind of lifestyle Bandon has to offer. In psychology, the Goldilocks Principle (from the children’s story “Goldilocks and the Three Bears”) refers to humans’ tendency to prefer a mid-range of conditions instead of the extremes. It’s no wonder, then, that people come to Bandon for the mild climate. It’s a welcome escape from the extremes of California and the Willamette Valley, and the growing season for all kinds of plants is longer. Summer temperatures in Bandon rarely get much warmer than the low 70s, but the sun shines almost every day. Walking on the beach in short sleeves and often shorts feels wonderful, and it puts residents and visitors alike in a great mood. The usually-present breeze off of the ocean keeps the air fresh and clean. I am still amazed at the change that happens when I drive east even 5 miles in the summer; the temperature rises by at least 10 degrees, and the air becomes drier and staler. In the winter, like the rest of Western Oregon, on average, the days are shorter, darker, cooler and wetter. However, ice and snow are very rare. With the ocean right there acting as a giant heat sink, the lowest average low in the winter only gets down to 39 degrees. A little-known bonus about Bandon is that, being at the northern end of the Oregon Coast’s “Banana Belt,” it’s not uncommon to have bright and sunny winter days with temperatures in the 60s. I’m not going to lie, it does rain in Bandon. Sometimes a lot. On average, Bandon receives approximately 59 inches of rain a year, compared to Portland’s 36 and San Francisco’s 24. About half of those 59 inches come in November through January. To me, that isn’t a deterrent. A native of the Pacific Northwest, I am accustomed to the rain, and it offers a certain amount of comfort, knowing that the area will never have a problem with water. The plants, humans, and other animals will stay healthily watered throughout the year. Plus, there’s something cozy and comforting about the rainstorms, especially watching them come in from the ocean. Summers are much drier; we get about an inch of rain in July and August combined. The 2010 census reported that Bandon has a population of 3,066, compared to nearly 600,000 in Portland (not counting the countless suburbs which add another 1.7 million for a grand total of almost 2.3 million people). This feels really different. With fewer people comes fewer cars, less traffic (no endless lineups at traffic signals nor impossible left turns), more parking places (which are free! ), and less noise. It also means that the other 3,065 people around me are happier. They are not dealing with blood pressure raising traffic and noise, and are, in general, less rushed. This means they are more able to take a minute to stop and talk on the street or in the store. This change of pace has, admittedly, taken some time to get used to. My anxiety still rises just a little when I pull up to the highway wanting to turn left, thinking that it might be a while and that I’ll have to floor it to get onto the highway before the week is through. Trying to get an insurance quote on the phone, I had to take some deep breaths to get myself to calm down and slow down while the person I was talking to was being friendly and chatty. This, I think, is a good kind of detox. The slowing of pace is one benefit of being in a small town, but there are more, especially where the others in the town are involved. Residents have the opportunity to get to know each other, and they treat each other like family. They rally around when someone needs support, and they watch out for each other’s kids. Growing up in a small town, I didn’t see that as a benefit. I didn’t like that my mom knew what I was up to before I even got home, but for parents, this is a great thing. Parents know their kids’ teachers, friends, and friends’ parents. It really does take a village to raise a child, and a small town like Bandon can actually be that village. Not only do the kids have to behave better with so many parental eyes on them, but the adults are motivated to behave better as well. Knowing that they will see the same people, whose names they know, on a daily basis, people treat each other with more kindness and patience. Another benefit of being in a small town is that there are opportunities to get involved in important issues and vital groups. It’s not difficult to meet and talk with people like the mayor, the city manager, and business owners who have a vested interest in the town. They are accessible and not so busy that they can’t make time for interested residents. 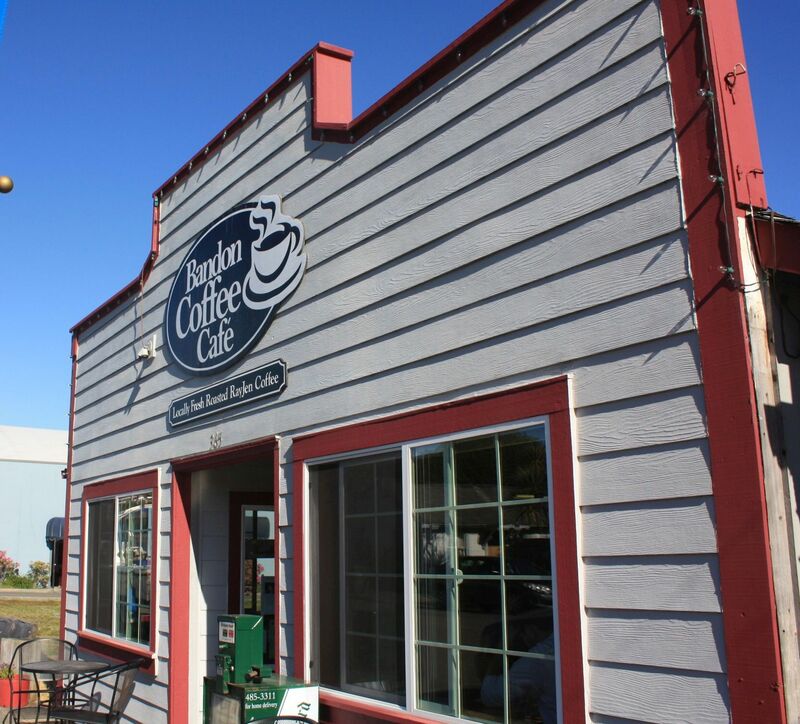 When looking at many different small towns in Oregon, we saw some towns that were too small to support basic amenities such as a grocery store, drug store and good coffee shop, and we saw that we would have to travel several miles to find these places. Other towns seemed like they supplied several towns in a large area and had big chain stores and restaurants. Neither of these situations appealed to me. stores. There are some, but they are kept to a minimum. Bandon has the things that are most important to me: two local chain supermarkets, 2 drug stores, a hospital, community theater, a fantastic library, hardware store, auto parts store, bike shop, and 2 locally owned coffee shops that cater to both residents and tourists. As tourism is one of Bandon’s key industries, there are also a number of great quality restaurants catering to many different palates. It is true, there is no Costco, no Starbucks, and no shopping mall, but Bandon would certainly be a different place with them, and I don’t think it would be a change for the better. If a person really needs them, they’re not terribly far away. simply gaze at the ocean for hours. I have heard a number of people talk about the calming effect of the constant movement and vastness of the sea. The diversity of shorebirds fascinates both bird enthusiasts and novices, and the starfish and sea anemones are fun to look at. And I get to live here. My daily walks are no longer on asphalt and concrete, they are on sand. I no longer have to dodge cars, and listen to the noise of the city. Now, the noise on my walks consists of the surf, birds, and wind. Instead of looking at densely packed-in houses and stores and miles of road, I get to look at the sea, the sand, birds, seals, starfish, seashells, other happy people and ecstatic dogs. One of the reasons I stayed in Portland as long as I did was that I told myself there were very few places in the country where I could be active outside year-round. I have found that the Southern Coast allows for that even more than Portland. Again, there is rain, but it’s never too cold to make it intolerable. The beach offers seemingly endless miles for walking and jogging, and if I ever get tired of the beach, the roads are free enough of traffic to walk, jog or bike safely. Hiking and mountain bike trails are surprisingly close. The kayaking in the area is highly rated, and there is a great windsurfing and kiteboarding spot fewer than 20 miles away. Of course there are even more outdoor activities than I am interested in. I would be remiss to neglect mentioning the golfing here. There is world-class golfing at the Bandon Dunes, and several other courses as well. A quick internet search nearly overwhelms a person looking for a place to play. Many people also fish in the ocean, the Coquille River that runs through town and the many surrounding lakes. Others enjoy crabbing right off of the dock in Old Town. There are many organized fishing and crabbing activities throughout the year, and the weekly newspaper includes a fishing report. Life on the Oregon Coast isn’t for everyone, but it’s certainly for many of us. In my opinion, Bandon is the best combination of everything the coast has to offer. I have to admit, I do miss some things about living in Portland. I miss having a drink and appetizers on the 30th floor overlooking the city and the Willamette River. I miss the snow-covered mountains and skiing on them. I miss having 73 microbreweries in the Portland Metro Area to choose from. But, the things I have gained far outweigh the things I no longer have.